Sure, that may be true, but if these Utes want to keep this dream season motoring along, if they want to keep shaking up the established order in the Pac-12 Conference, if they are to keep on asserting themselves the way they have the last few months, they needed this one. Because no matter how mentally tough a team is, no matter how sturdy their specific brand of will might be, a brutal stretch is still, at the end of the day, a brutal stretch. And the Utes kicked one off Friday night inside the Huntsman Center against the Cal Golden Bears, an annual contender in the Pac-12, which is regarded as one of the deepest conference in college basketball. The No. 21 Utes needed to keep it going, to top Cal and to keep on plowing ahead into the most daunting part of their season. What’s ahead is No. 6 Stanford Sunday in Salt Lake. Next Friday Utah goes to No. 5 Oregon. Two days later, they’re at No. 9 Oregon State. “We just have to keep doing what we’re doing,” Roberts said. What they’re doing — and what they did once more Friday night against Cal — was showcase why these 17-1 Utes believe they have a shot against anyone, anywhere, at any time. Utah topped Cal 87-74 behind the usual contributors. Star senior Megan Huff had 24 points and nine rebounds despite being saddled with foul trouble most of the night. Junior guard Kiana Moore (18 points and eight rebounds) and redshirt freshman Dru Gylten (11 points and six assists) never stopped moving, tiring out a Golden Bear rotation that, like Utah’s, doesn’t go very deep at all. And freshman forward Dre’Una Edwards chipped in 15 points on 6 of 9 shooting. Moore, in particular, pestered the Cal defense. 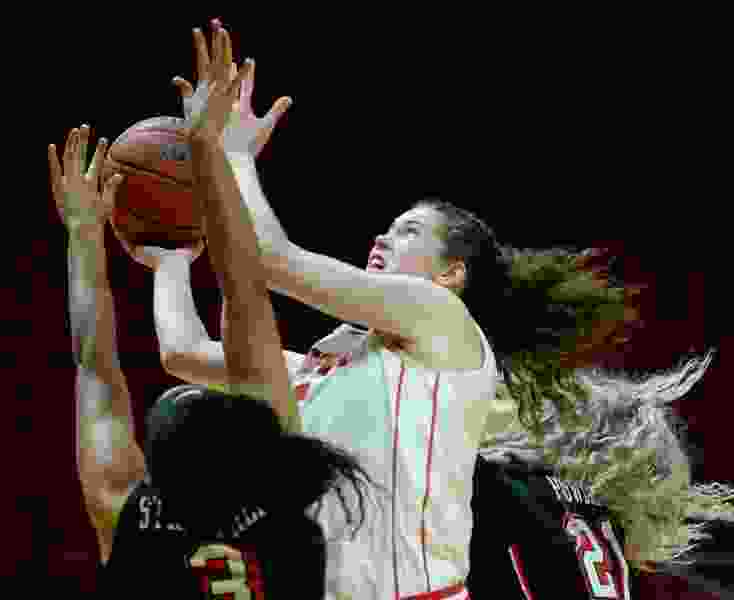 The 5-foot-7 guard from Fairfield, Calif., operated smoothly around the paint, draining jumpers, moving so quickly so often that she found herself wide open for a few layups. And when it was time to fire away from 3, she did and nailed two of Utah’s eight. Her role has expanded heavily since senior Daneesha Provo suffered a season-ending knee injury three weeks ago. Moore played all 40 minutes Friday against Cal. Utah is now 6-1 in Pac-12 play with perennial powerhouse Stanford in the house Sunday. The Utes have 24 hours to prep for the first of three straight Top-10 showdowns. Which is exactly why Friday night’s win over Cal, now 12-6, was a must. These Utes showed that they can keep doing what they’ve been doing.